IM Anna Rudolf plays blitz chess against Premium users at Chess24.com while talking about her moves. Daniel King analyses Aronian vs Anand from Leuven 2018. Stormästarna Evgenij Miroshnichenko och Alexandra Kosteniuk kommenterar sista dagen i Tal Memorial som är blixtturneringen. 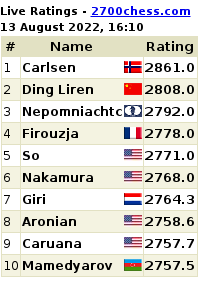 Day six of 2017 Champions Showdown, GM Magnus Carlsen and GM Ding Liren are bringing up the rear and catching up to the other players who finished their rounds on Sunday, November 12. Hikaru Nakamura vs Veselin Topalov. Fabiano Caruana vs Alexander Grischuk. 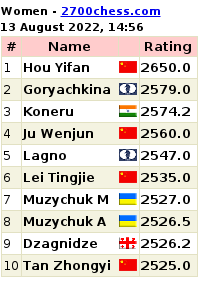 Wesley So vs Leinier Dominguez. Coverage provided by the commentary team of Maurice Ashley, Yasser Seirawan, and Jennifer Shahade.